This essay is the first piece of writing I’ve done by hand, start to finish, since 5th grade | Ross Gale is a writer and editor from the Pacific Northwest. When I write by hand the correlation between the thoughts in my head and what ends up on the page is a lot closer to 1:1. This is good in one sense: When I write by hand the process doesn’t prevent me from putting into words what I already know. It might be bad in another sense: My ideas as they come straight out of my head aren’t necessarily my best ideas; it’s possible that all the reconfiguring I do on the computer produces more sophisticated thoughts and better forms of expression. I don’t know. 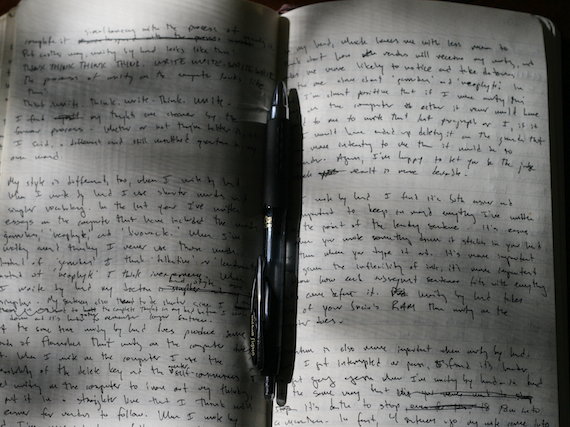 Writing by hand also alters the relationship between forming a thought and recording it in words. When I write by hand I almost always form a complete sentence in my head before I write it down. When I write on the computer I tend to start typing at the onset of an idea or a sentence that I then figure out how to complete during the process of recording it. i know how you feel. i like writing with pen and paper for essays, outlines, lots of things. That’s a nice looking pen. And strong penmanship. people either think my handwriting is cool or looks like chicken scratch. i probably made a better effort because i knew i was posting that entry as a written picture instead of typed.